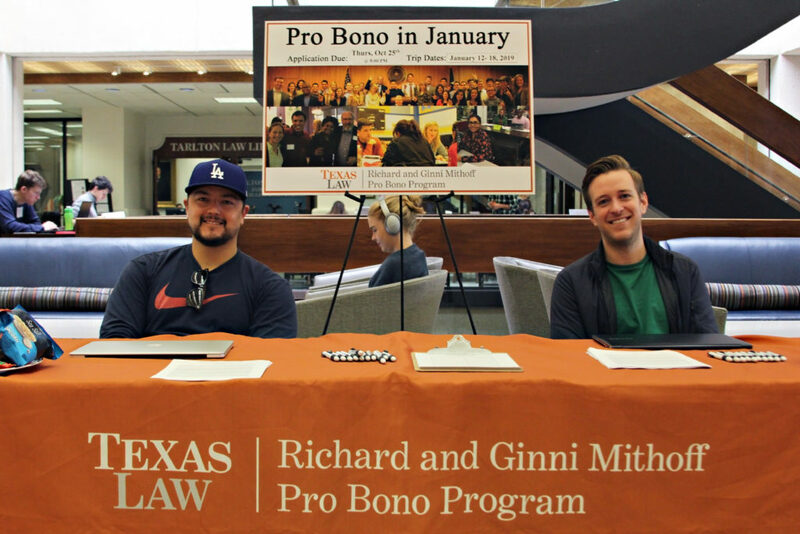 National Pro Bono Celebration 2018 at Texas Law: Pro Bono in January leadership team members Tom de la Torre ’19 and Kevin Robinson ’20 tabled during the week to spread the word about the winter break trip. 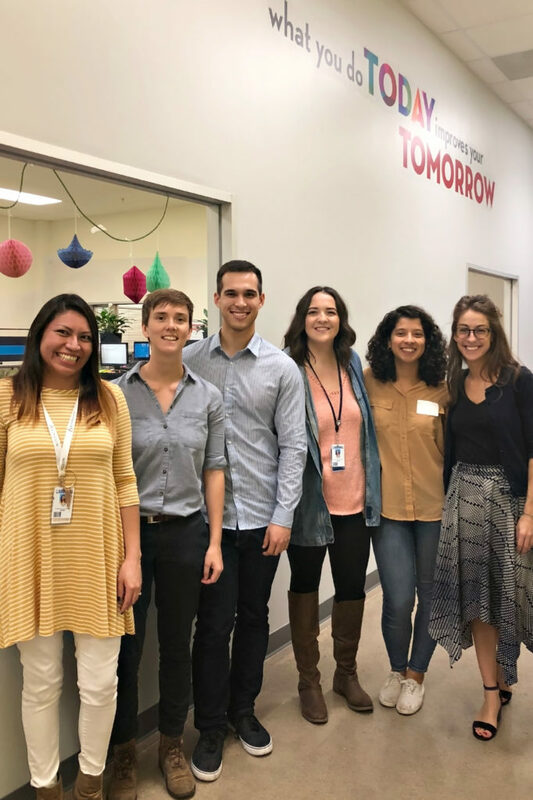 Pro Bono Scholars Natalie Neill ’20 and Haley Farrell ’19, with Ashley Alcantara ’20 and Goodwill Industries staffers at a driver license recovery clinic. The Richard and Ginni Mithoff Pro Bono Program participated in the American Bar Association’s 2018 National Pro Bono Celebration, sponsoring a number of events during the week of October 21-27. On October 24, the Mithoff Program continued its tradition of featuring successful pro bono collaborations between nonprofit organizations and the private bar during the Annual Celebrate Pro Bono Luncheon. The 2018 event, “Turning Outrage Into Action: The Pro Bono Response to Family Separation,” highlighted the Austin legal community’s response to the family separation crisis. Last spring and summer, the U.S. government separated more than 2,000 migrant children from their parents. Thousands of lawyers from diverse practice backgrounds took action, delivering pro bono legal services to separated parents and children. The luncheon featured the response of four Texas Law alums working in a variety of practice settings: Whitney Drake ’14, staff attorney at American Gateways; big-law lawyer Brooke Goodlett ’10; Elizabeth Pearsall Lippincott ‘94, senior strategist at Vianovo; and Kate Lincoln-Goldfinch ‘08, founder of Lincoln-Goldfinch Law. 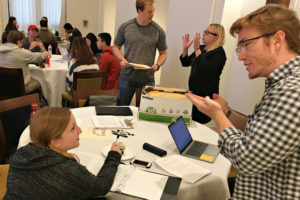 Texas Law students also participated in a number of pro bono projects and trainings during the National Pro Bono Celebration. Students assisted asylum seekers detained in the Hutto and Karnes City immigration detention facilities; volunteered at the Austin Bar Association’s Veterans Legal Advice Clinic; drafted petitions for expunction and non-disclosure of criminal records; and assisted individuals with driver license holds related to unpaid criminal justice debt. Over 65 Texas Law student participated in pro bono projects and trainings during the week, donating over 290 hours of pro bono service. Pro Bono Scholars Ruthie Goldstein ’20 and David Miracchi ‘20, with Zach Smith, Lead Student Counselor, and Justice Center/Mithoff Pro Bono Program staff attorney Meg Clifford at an expunction clinic work session. 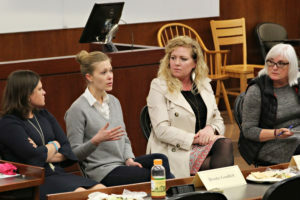 Luncheon panelists Brooke Goodlett ’10, Whitney Drake ’14, Kate Lincoln-Goldfinch ‘08, and Elizabeth Pearsall Lippincott ’94.